Eating almonds with diabetes helps control blood sugar rather than raise it. This is because almonds are a low-glycemic food (low glycemic index and low glycemic load values) which means their effects on blood sugar are minimal. This effect is owed to a dense nutritional profile, particularly a high fat content: 100 g of almonds has almost 50 g of fat, 1 cup of whole kernels (at 143 g) has 71.4 g of fat while a serving of 1 oz (28.35 g or 23 kernels) has over 14 g of fat. Dietary fat lengthens digestion time which, in turn, slows down the rate of sugar absorption into the bloodstream. 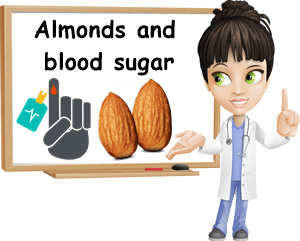 Basically, the glycemic effects of the fat offset the glycemic effects of the carbohydrates in almonds, resulting in better blood sugar control. Other elements of nutrition, notably protein and dietary fiber, further contribute to this effect. Studies show dietary magnesium is another element that contributes to improved blood sugar control and almonds provide 270 mg of magnesium per 100 g, 386 mg per cup (143 g a cup) and 77 mg per oz (28.35 g or 23 kernels) – an average adult requires a minimum of 400-420 mg of magnesium a day. Plenty of studies have shown that eating raw nuts regularly, whether almonds or walnuts or peanuts or other varieties, holds benefits for insulin control in diabetics and patients with metabolic syndrome. Because of their particular nutritional profile, notably high-fat content, raw nuts contribute improved insulin sensitivity by reducing fasting insulin levels and insulin resistance, in addition to lowering blood sugar levels. Almonds are a low-glycemic food, meaning their effects on blood sugar are minimal. But these effects also extend over other foods. In other words, eating almonds together with foods that are higher glycemic lowers the effects on blood sugar of those other foods. For example, having a serving of almonds with a fruit such as a banana, with a serving of cantaloupe, with bread, vegetables or other carbohydrates can lower the glycemic effects of the entire meal. How many almonds can you eat per day with diabetes? On average, 1 oz or the equivalent of 28.35 g or 23 almonds is considered a good serving of the nut variety. Eating this much should not produce any side effects, but still provide benefits for diabetes. Of course, this is merely a general recommendation and does not necessarily apply to everyone. Some diabetics are better off keeping their intake of nuts low, others may eat double this amount. Some are better off eating nuts less frequently (not every single day), others can eat them every day and still enjoy the benefits they have to offer and no side effects. Overall, you can eat almonds with diabetes so long as you keep your intake reasonable, according to your individual nutritional requirements determined by your level of physical activity. Almonds are good for diabetes-associated hypertension because of their good potassium and magnesium content. Both magnesium and potassium lower high blood pressure (hypertension), a common complication of diabetes. 100 g of almonds provides 270 mg of magnesium (roughly 25% of the recommended daily intake, RDI for an average adult) and 733 mg of potassium (roughly 15% of the RDI). A serving of 1 oz has 77 mg of magnesium and 208 mg of potassium. Also, almonds are naturally low in sodium so including them into your diet should benefit blood pressure even more. Studies show that eating almonds regularly with diabetes contributes to lower total cholesterol levels as well as reduces oxidative damage to lipids, contributing to better overall cardiovascular health, an important aspect of diabetic health. Almonds draw their cardiovascular benefits from a particular fat profile: out of almost 50 g of total fat, less than 4 g of saturated fatty acids, over 31 g of monounsaturated fatty acids and over 12 g of polyunsaturated fatty acids. A generous fiber content (12.5 g of fiber per 100 g) along with a rich vitamin E content (25.6 mg of vitamin E per 100 g) further contribute to the cholesterol-lowering properties of almonds and their protective effects on vascular health, including antioxidant and anti-inflammatory properties. Vitamin B3 (3.385 mg per 100 g or over 20% of RDI) rises HDL or good cholesterol levels. With 25.6 mg of vitamin per 100 g, accounting for over 170% of the recommended daily intake, RDI of the vitamin for an average adult, almonds help maintain healthy skin cell membranes and exert strong antioxidant and anti-inflammatory effects. A rich and varied B vitamin profile helps prevent dryness that could expose the skin to infections. Zinc (3.08 mg per 100 g, or over 30% of RDI) helps strengthen the immune system, prevent wound infection and promote faster wound healing. Lastly, protein containing both essential and non-essential amino acids helps build strong, healthy skin cells. The overall benefit is a healthy skin with an improved ability to regenerate and less infection risks. It’s not just vitamin A that helps us achieve good vision and healthy eyes. With almonds, it’s the range of B vitamins that contributes to good vision. B-group vitamins are essential for nervous system health and their benefits extend to the optic nerve too. In poorly managed diabetes, the optic nerve is often affected by continual hyperglycemia (high blood sugar). But B vitamins help prevent, to a certain extent, nerve damage as well as support nerve functions, playing an important part in eye health. Once again, it’s all about B vitamins. 100 g of almonds provides almost 20% of the entire recommended daily intake, RDI of vitamin B1, about 85% vitamin B2, over 20% vitamin B3, almost 10% vitamin B5 and over 10% B6, B9 and choline. In addition to their benefits for skin, B-group vitamins help maintain normal nerve function, preventing and helping repair injury to nerves. Getting enough of all of these B vitamins and also vitamin B12 from animal foods can help with diabetes-associated nerve damage that affects movement and possibly alleviate symptoms such as pain, twitching, numbness, tingling, cramping, poor coordination and even loss of feeling in hands and feet. High in fat, protein and fiber, almonds are especially satiating and help curb hunger and cravings. The excellent amounts of dietary fiber in them (12.5 g of fiber per 100 g) help regulate digestion and reduce fat absorption at the intestinal level, indirectly contributing to weight control. In addition to the satiation provided by the fat, protein and fiber content, almonds further boost energy levels thanks to a generous B vitamin profile and restore vitality as a result of good iron values, supporting an active lifestyle that encourages weight loss. Note: When looking to include almonds or other nuts into your diet, it is important to adjust your intake of them and the rest of your diet so that you account for the calories and fat provided by the almonds/other nuts. This can be done by substituting other unhealthier options with the visibly healthier raw almonds or, if you’re diet is balanced and relatively healthy, increasing your daily activity to help use up the extra energy you are getting.